This is so lovely and tasty! I created this since I wanted the FLAVOR of risotto but didn’t have any arborio rice to MAKE risotto. In a large pot that’s been sprayed with cooking spray on medium heat, add your shallots and cook until soft, about 2-3 minutes. Stir often as we don’t want BURNED shallots! Add your garlic and the white wine. Reduce the wine for about 4-5 minutes. Add in your peas, shrimp, a bit of the cooking water from the pasta, and the pesto. Cook for about 8 minutes, until the peas and shrimp are heated through. Add in your Parmesan cheese, butter, salt, and pepper to taste. 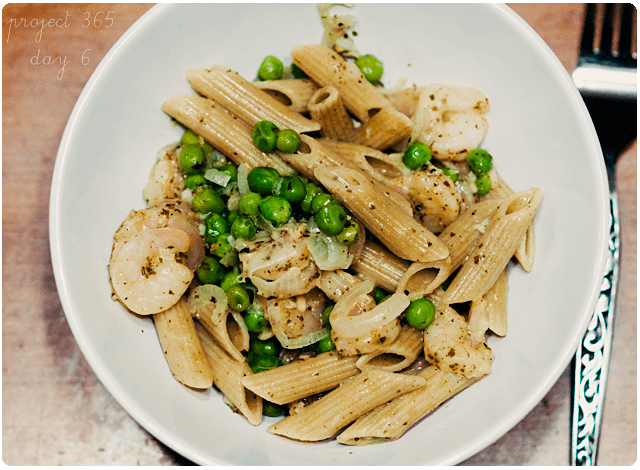 Toss with the whole wheat penne. This recipe makes 6 servings. Each serving is 1C. Everyone, especially my husband LOVED this pasta dish. It’s really so simple to make as long as you have everything on hand. It’s so delicious AND fast to make. Yummm!!! This looks really good. It really is and it’s so easy to change from shrimp to chicken or any other protein! I’ve saved this for our next meal plan!